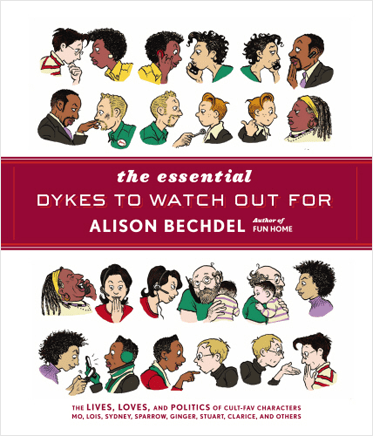 I had heard of Dykes To Watch Out For by Alison Bechdel long before Bechdel published her first graphic memoir, Fun Home. But, not being one of the cool kids, I didn’t read it. Fast-forward many years, some Christmas money and one gay bookstore later and I finally had my very own copy of The Essential Dykes To Watch Out For in my lovely lady hands. The fun was to begin! A collection of strips chronically the DTWOF series, published from 1987 to 2008, The Essential DTWOF is an incredible gift to those of us born too late to enjoy them in their initial incarnations. Bechdel opens the collection with a graphic introduction that not only gives insight into the origins and ethos of DTWOF but a smidgen of Bechdel’s wonderful madness. An intelligent, intense attention to detail that is necessary in order to so skillful combine personalities, identities, community, love and politics in comic form. Like the opening of any novel, I carefully watched as these independent characters began to take on their full personalities: refractions of lesbian identities embodied in myriad guises, ticks, and quirks. But, unlike the plain written word, I also got to witness as Bechdel refined each character, moving from strength to strength in the comic: Mo and Toni’s quaffs reach nuanced status, Lois’s swagger oozes, and newspapers offer rotating headlines of the week. Halfway through DTWOF I kept making excuses in avoidance of my daily life—“Emails can wait, right? I didn’t want to do dishes today anyway.”—in order to carry on reading. I thoroughly enjoyed the twists and complications and emotional freak-outs of these devoted heroines with each turn of the page. Politics and life become inextricable when the Bush years hit at the turn of the 21st century and reading gets a bit heavy. If I ever I needed a reminder of what it was like to live under the Bush administration, this comic reflects some of my biggest worries from that time. But, the characters continue as their engaging selves and the way Bechdel handles 9/11, well, let’s just say it’s pitch perfect. For those that are looking for a tidy ending to an elegant series, you won’t find it here. The comic ends as it begins: mid-moment in a community of messy, human lives. That said, there is a kind of relief in the final moments of The Essential DTWOF: it’s as if the video feed from the dykes’ world has been simply closed off with Mo, Sydney, Lois, Clarice, Toni, Ginger, Sparrow and the others carrying on without our watchful eye and it is our job, as the readers, to remember all that they taught us. This entry was posted in Lesbrary Reviews and tagged Alison Bechdel, erica gillingham by danikaellis. Bookmark the permalink.